‪If you told me a year ago that one day, I would be walking past some of the most beautiful pieces of fine art in the world, I wouldn’t have believed you. ‪But that is exactly what I did this past summer. 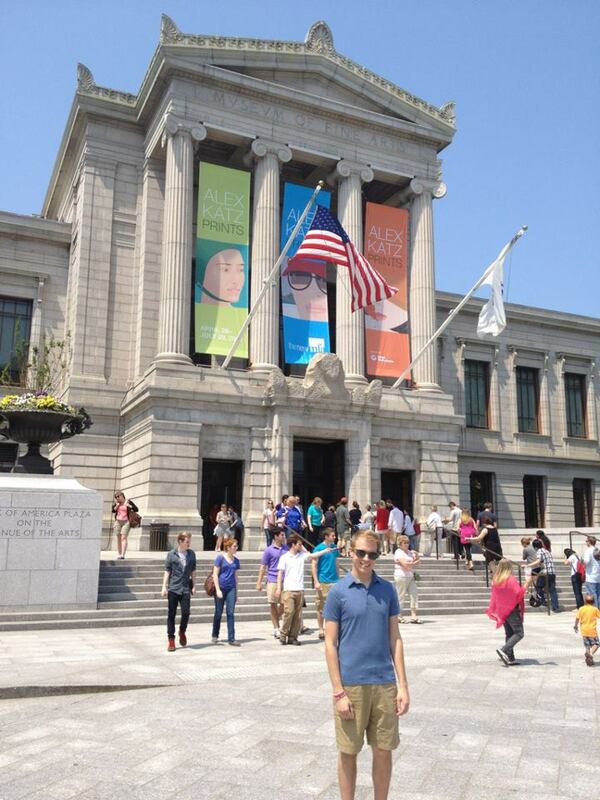 ‪From late May to the middle of August, I interned with the public relations department at the Museum of Fine Arts, Boston (MFA). Walking past works by Renoir, Sargent and Van Gogh became part of my daily routine, and soon, I was showing all of my friends around the museum. As an advocate for and participant in the arts, I found myself very much at home. ‪During my shifts at the MFA, I updated the department’s college media list, researched local high teas for a new afternoon tea program, escorted media throughout the museum and wrote pitches and suggested social media tactics to promote the museum’s restaurants and executive chef. I also had the chance to assist with the MFA’s first ever social media contest, Grandstand to Gallery. The MFA collaborated with the Boston Red Sox for their 100th season in an exhibition where pictures of Fenway Park were collected and voted on through social media. I assisted the department in the winners’ reception, where I helped coordinate pictures with the MFA photographer and interacted with media. Throughout my time at the MFA, I learned about the value of media relations in a museum setting and how to communicate internally with the entire staff. ‪At UD, I participate in two performing arts organizations. I sing with the MelUDees Coed A cappella group and I am a brother of Phi Mu Alpha Sinfonia Men’s Music Fraternity. I hold communication and public relations positions in both organizations. I find that my passion for effective and strategic communication stems from my love of the arts and its ability to send a message to various audiences. Getting the right message to the right people is important, and I believe that public relations professionals should strive to make sure that their messages reach their audiences in new and exciting ways. An organization’s core audience deserves to know what is happening within the organization, and an untapped, but potential new audience deserves to hear the message. I enjoy promoting the arts because it, in turn, promotes the artist’s message and the expression of their work. ‪My involvement with the Public Relations Student Society of America on campus provides me with the opportunity to learn about and practice the craft of communicating for an organization. As the public relations director, I leverage social media for purposes of communicating to our members. As a general executive board member, I advocate for our mission. I advocate for communication as a noble field that strives to get truthful information out to the public. I am truly grateful for all of the experiences I’ve had during my college career because they’ve taught me about myself. They have taught me the skills I need to practice the craft of communication and public relations in the most effective manner. Although I will be sad to leave UD in May, I am excited to start a career where I can continue fueling my passions. Bobby Schrader is a senior mass communication major with minors in advertising and journalism. He currently serves as the public relations director of PRSSA-UD. On campus, he sings with the MelUDees Coed A cappella group, is a brother of Phi Mu Alpha Sinfonia and works for the Office of Admissions as a Blue Hen Ambassador. Read his blog at rtschrader.wordpress.com and follow him on Twitter @BSchrader412.